For all you loyal readers, you might remember that I promised to explain to you this week's rather eclectic listening choice. Normally I just sort of choose whatever artist strikes my fancy or happens to intrigue me on that particular day (though I tend to try and avoid consecutive artists from the same decade, as a loose rule). But there is a fourfold reason for this week's investigation of Little Walter. For one, my exposure to popular music before the 1960s has been very limited. Last summer I had a week where I listened to Robert Johnson, and another where I listened to Johnny Cash, including his early stuff. But there's a lot of great names that are thrown around, the old Kings of blues and country and jazz, who were very influential in a lot of respects, and I think it's fun to look back and listen to some of the former greats. We like to think history can be traced as a single line of progression, where the causes and the effects are obvious and everything is constantly moving forward. Things are never that simple, of course, but that doesn't mean you can't try and link certain cultural and artistic movements together. Even in our present day, it's hard to realize the myriad of historical influences that are tugging on us in every direction, let alone who was influenced by what in the past. But it's fun to try, and I don't think it's a completely fruitless endeavor. This brings me to reason number two for this week's choice - the fact that I listened to Cream last week. As I reported, I was particularly taken by Cream's version of blues-rock, and especially by the harmonica solos. This got me thinking about the blues harmonica, and what harmonicists of yore might have influenced the band. As it turns out, pretty much every harmonica player of the past sixty years plays in the shadow of Little Walter, a giant in this small musical subgenre, and the only artist inducted to the Rock and Roll Hall of Fame primarily for his work on the harmonica. So I grabbed some "Best Of" CDs and introduced myself to his music this week. And that's part of the fun of exploring old music - you're never quite sure where it's going to take you next. WHAT I KNEW BEFORE: Nothing. The man's name rang a bell, probably because I'd seen him on one of those Greatest Albums of All-Time lists in Rolling Stone or something, but I wasn't even aware of his significance as a harmonica player. MY LISTENING: A vacation prevented me from my normal habit of picking one album to listen to every day, but Little Walter was a singles artist anyway, with only one album - a Best Of - released during his lifetime. I spent most of the week going through the two disc The Essential Little Walter (1993), with some dabbling with The Best of Little Walter (1958) and Little Walter: The Chess Years (1952-1963) (1992). 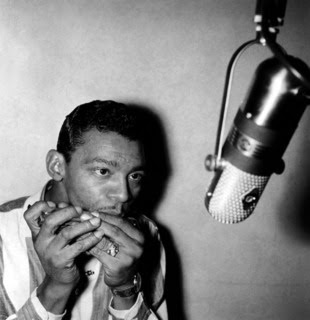 The third reason that I chose Little Walter this week is that I'm a harmonica player myself. I play mostly old fiddle tunes and folk songs, but I've been working on the blues more and more lately, and it was a lot of fun to listen to the man who pretty much invented the repertoire. A lot of times when you go back to the past and experience an influential artist, it can be boring. When an artist is so influential, their work so pervasive in the present day, it's hard to experience what a shock it must have been to hear the music for the first time. (Listen to Stravinsky's Rite of Spring, for example, and tell me it would start a riot today). But Little Walter's music still packs quite a punch. Perhaps it's because he plays the blues. The old-fashioned twelve-bar blues songs have a way of sounding timeless, like something that has been present in the roots of America for millenia. It's a great kind of music, and Little Walter manages to hit both its poles perfectly - he can grind out some riffs on the harmonica so fast that the rest of the instruments can barely keep up. But he can also slow it down, and draw every ounce of melancholy and anguish out of the notes, bending the tones to give the blues just that hint of being slightly off, the note not moving quite where you expect. But in the end, the blues have an intense forward drive, and even though it's only a twelve-measure pattern with three chords, it's amazing how many variations Little Walter can wail out without it sounding repetitive. These blues songs are great for that feeling of catharsis, slowly building as the music stumbles toward some sort of loud riff at the end as the piano jangles and the cymbals roll. Little Walter was also one of the first harmonica players to take advantage of electrically amplified acoustics. You'd think this might be an impediment, but instead he uses microphones and the like to his advantage, drawing sounds out of the instrument that you didn't know were possible. He's been described as the first artist of any kind to intentionally use electrical distortion, and listening to the simply titled "Boogie" demonstrates his prowess. Finally, the fourth reason I chose Little Walter this week was because I took a vacation to New Orleans. Driving through the bayous of Louisiana and the Mississippi Delta, I assumed that Louisiana-native Little Walter's music would be appropriate. And it was, both driving there to the promising reunion with old friends, and driving home and pondering the fact that I was still alive and in one piece. When music works for both arrivals and departures, you know it's good music. I'm easy to please, and this tends to be the slimmest section regardless, but it's going to be shorter than usual this week. In case you couldn't tell, I liked Little Walter a lot. I will state that he's better listened to in small doses - there's no need to listen to one of his four volume anthologies all at once, like I tried to do during my drive today. Instead, choose a song or two when you're feeling blue. Like many older artists, he works better in smaller chunks. FURTHER EXPLORATION WOULD ENTAIL: In addition to his own stuff, Little Walter played backing harmonica for a lot of the old Chess Records artists. However, he got his start playing with Muddy Waters' band, which would probably be a good next step. BEST SONG YOU'VE HEARD: "Juke"
BEST SONG YOU HAVEN'T HEARD: "Back Track"